World Data Products, Inc. is committed to complete customer satisfaction and continual improvement. Every World Data Products employee will understand our Vision and their individual responsibilities in fulfilling our Quality Metrics as defined in our Quality Management System and the ISO standard. 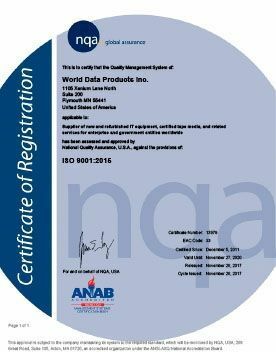 World Data Products, Inc. has a certified ISO 9001:2015 Quality Management System. View a pdf of our Certificate of Registration here.